Swim Survival School: Cruel Or Kind? With the recent spate of drownings and near drownings in Australia this summer (since December 1 2018 seventy-three people have drowned around the country), many parents are asking themselves, what can I do to prevent this tragedy from occurring in my family? While pool gates or gadgets to put around a pool are essentials in any backyard pool set up, there is no deterrent good enough for a child if no one is there watching. Experts are now saying the next best thing you can do is to teach our kids swim survival skills from as young as 6 months. ‘Swim Survival’ schools aim to teach children under five the skills to swim independently, without help from flotation devices or unnecessary intervention from instructors or parents. However, while children under 5 are the most at risk of drowning, parents seem to be reluctant to enrol their kids into these types of lessons, preferring the traditional ‘parent and me’ swim lessons which promote water confidence rather than what to do should they accidentally fall in the water without an adult around. A lot of parents simply can’t get their head around the swim survival school methods of teaching babies (from as young as 6 months) how to stay in a floating and breathing posture until help arrives. Recently, a video of a young girl attending Infant Swim, a swim survival school in Sydney, went viral clocking up over 1 million views on Facebook. The little swimmer in this video happened to be the daughter of ellaslist team member, Susan. We asked Susan about her experience sending her daughter Shayla (aged 1 at the time) to the school and why she recommends it to all parents in Australia. 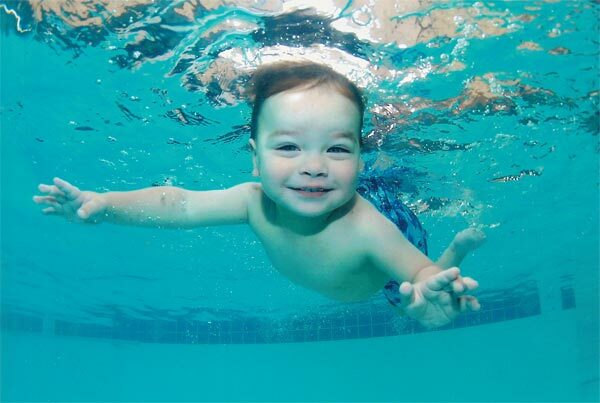 What kinds of skills did Infant Swim teach your child in the 8 week course? It taught Shayla to float on her back from any position entering the water. It also taught her to open her eyes in the water to look for the edge of the pool, to dog paddle to the side and if she ran out of breath, and to roll onto her back to float. How confident would you say Shayla is in the water now? She’s always been confident in the water which is why we started her in swim survival as she, like most toddlers, had no fear! She’s very confident in the water now, she enjoys the challenges of swimming and floating. She makes floating look effortless. What were your reservations about swim survival school? My only reservation was the time commitment from my end. It was 5 days a week for 6 weeks (she completed it early). Having done the course now I certainly wouldn’t hesitate to take the time from work to take her. It’s 10 minutes a day, one on one which teaches her a skill for life. Was there anything in the program that made you feel uncomfortable? When she first started, she cried during the 10 minute lesson which was hard. I know her cries and I could see she cried because she was in a pool with a stranger, not because she was distressed – nevertheless I still wanted to soothe her. As it is a one on one lesson, there is the utmost care. The instructor knows if she has swallowed too much water or gulped too much air and needs to burp her. She was 1 at the time, so they guide her in the water by holding her in certain ways and using hand gestures that she understood really quickly through repetition and encouragement. As the lessons are 5 times a week the progression was quick, I could see by day 4 that she was starting to float (after 40 minutes). The lesson is tailored to suit her and follows her progress and ability. By week 6 she could float and didn’t need to continue to 8 weeks. Do you think it gives children or parents a false sense of security around water? I see it like insurance. You take it out for peace of mind hoping to never use it. Yes she can float but it doesn’t give her the ability to judge danger or something life threatening – she is still a toddler and I am certainly still responsible for her safety at all times. We don’t have a pool and don’t live near the water but there has been occasions when she’s slipped in the baby pool and instantly gone into a float. She has been dumped standing on the sand watching the waves and has gone into a float which has been amazing to see. So, what do the critics say? Well, some say the swim survival school is cruel and can actually leave children with a fear of the water. Others say that it is just too distressing to see their child involved in this style of lessons and seeing their child upset isn’t worth it. As always we recommend that you trust your instincts when it comes to any style of swimming lessons – only you as the parent can make this decision. If you are interested in enrolling your child in swim survival school ellaslist recommends Infant Swim in Coogee, Lilli Pilli, Figtree and Balgowlah. BEST THING WE EVER DID FOR OUR CHILDREN! I can't recommend these swimming lessons enough, they are fabulous. Did my children cry? Yes. But my children cried for 2 years straight at daycare drop off too. The method is far from traumatic, it's gentle repetition that not only teaches them life saving skills, but also water awareness &amp; confidence too. We tried 'mums &amp; bubs' first and hated it, it taught the babies that someone would always be there to catch them when they jump in. As far as I'm concerned, it's counterproductive as it teaches them that water is fun, not dangerous. We are forever grateful that survival lessons exist in Australia &amp; the swimming bodies should be supporting it, not bad mouthing it! KASS is second to none. It's disgraceful to think of the time and energy parents &amp; instructors have to put into defending this break through in swim safety. Our daughter happily attended traditional lessons from 4 months to 2.5 years until we gave KASS a try. Whilst she had attended many, many lessons she still could not swim or even float in the water.. too soon for her development stage apparently. So having attended KASS for a brief 8 weeks and at age 3 she can confidently swim a lap of the pool, float to asses her surroundings whilst catching a vital breath and spends countless supervised hours as she practices her aquatic skills. There are no more tears when water gets her eyes, no more panic when something catches her off guard in the water. She is just as confident of her skills as we are. KASS you are a winner every time. Educate yourself people. WHY do the POSITIVE comments always come from parents that have actually first hand experienced the KASS survival program? Yet all the negative ones are from other people in the swim industry or people who HAVE not witnessed Survival Swimming Lessons first hand in real life. I wonder WHY? Yes I admit I work in the survival swim industry and what I find extremely hypocritical is the many, many traditional swimming lessons from the endorsed organizations mentioned above, where I have witnessed first hand, children screaming and crying, yet those lessons are not considered to be traumatizing or effecting the brain development of a child. FYI Survival lessons DO NOT traumatiise a child, putting a child out of their comfort zones does not traumatized a child. Feel free to read testimonial on website www.infantswim.com from a clinical psychologist stating this. All survival instructors are highly trained. We never ever just throw a child in the water and let them figured it out for themselves. I agree with comments above nothing beats 'adult supervision' and no child or adult for that matter is "watersafe" but unfortunately accidents DO and will continue to happen and survival lessons as proven above are another line of defense to prevent drownings if supervision has failed. Once again I agree with comments above 'parent and baby classes' or classes using any type of flotation device whilst the child is learning to swim, provide more than 'confidence' they also provide a FALSE sense of security! The KASS program is the best! I started training in this program October 2016 and now teach it in Perth. All instructors are AUSTSWIM qualified in both Teacher of Swimming and Water Safety, and Teacher of Infant and Preschool Aquatics. I decided to join the KASS team after I came to realise that most children do not know what to do if they were to fall into a body of water and nobody was there to help them even after years of swimming lessons. Even supposedly good swimmers would still panic if they eventually couldn't touch the bottom or the distance was too far. In most infant classes and early levels, children are taught to swim with either a parent supporting them or some sort of floatation device. The child doesn't have a true sense of buoyancy, movement or how to breathe. I found out about KASS, asked lots of questions, and then did the 6 week training course. The training was intense both in and out of the water, but I loved it. (AUSTSWIM courses are only 1-2 day courses!). Now I teach survival classes and am constantly amazed. I have had children learning these skills in 4 weeks! (Most take between 5-8 weeks depending on the child). I have NEVER found this method of teaching traumatic for the child, forced or anything negative. Yes a child may cry at the beginning (which is more about being separated from the parent, is with a stranger, or is learning a new skill). Other aquatic teachers who don't like this program don't know what is truly happening in a lesson. They just see a crying child and make judgments. Many children cry in traditional programs even with parents holding them! I love the children I teach and have their welfare as my top priority. I couldn't go back to the traditional method of swimming after teaching survival. I see how well survival works and how safer, competent and happy swimmers come from this program. Supervision of children around water is still the first priority! Having done both types of swim lessons, traditional ones with my twin boys (now 8yrs old) and survival swim with my daughter (18 months when she completed the survival swim course), I can absolutely endorse the survival swim school choice. The difference between the boys ability to float, swim and confidence compared to my daughter is unbelievable. After 6 weeks she could go into the water float on her back and flip over to swim toward the edge; then if she couldn't make it she would flip over and float again. This is previous time for her to either make the edge or an adult to save her; I could definitely not say the same for the boys at that stage. Yes they loved the water and were comfortable, but could they float and survive NO WAY!! Now my daughter continues structured swim lessons with her teacher (the same who taught her survival swim) and from other trips to public pools and holidays, is miles ahead of other kids her age. I always get stopped and people mention how amazing she is to swim so well; and she LOVES the water and swimming. Did she cry during survival swim? Yes at times, but have you been to traditional swim lessons and not seen kids cry? These lessons weren't around when I had the twins, but I wish they were and 100% endorse them; and if it meant the difference between your kid floating and surviving for 2-3 mins so you could grab them or them sinking and panicking you would too. My daughter went to WAterwise swim school in Perth and I can happily say that Stacey is fabulous with the kids and very gentle, so please actually go and witness a lesson before you dismiss it and believe that kids are just dropped head first into a pool and forced to swim. Both of my boys have learnt to swim via the kass program. I find it very offensive that people describe these lessons as being traumatic. Both my children are like little fish. They are competent as well as confident in the water, love swimming &amp; spend the weekends in their grandparents swimming pool. Although my children have these amazing skills, I'd never leave them Unsupervised in a pool area &amp; they know the rules that they do not enter a pool area without an adult. (My eldest is 8 &amp; can open a pool fence). My husband is a paramedic &amp; has had the unfortunate job of attending two toddler drownings in backyard pools.. this is the reason why we chose these lessons. I urge anyone with negative comments to please go &amp; observe a child learning to swim at kass. There is no trauma, no tough love or being thrown in, there is love, these instructors are empowering our children to be able to survive if they unexpectedly fall into a body of water. Please don't disregard these lessons, instructors or their parents, work together to reduce drowning statistics. My friend's daughter goes to swimming lessons, once a week since she was 6 months old, she's now 4, and she still needed assistance in the pool (floatie). My other friend took her daughter, who is also 4, to swim survival when she was 2.5 years old, she swims occasionally when she goes somewhere with a pool and can swim completely unassisted. To me this was a no brainer! I would prefer my child to survive in the pool rather then swim with a floatie. I believe this type of training is completely fine for a child. My 2.5 year old loves the program! She cried for 2 lessons at the beginning and her cry was not a traumatic one, more of a "I'm not sure what's going on" cry. I recommend this to everyone! Absolutely! Survival swim is an amazing program and it is a shame more people, particularly in the swim industry, don't take the time to come and observe lessons held by KASS or Infant Aquatics and see for themselves that it is not traumatic, does not cause trauma to a child and does not constitute child abuse in any form. Anyone who works with children does so because they love children !!! Just because some children cry in the lessons, does not mean they are traumatised. Parents know that their children cry several times a day for various reasons. They have limited ways of expressing themselves. Unfortunately there are very few learn to swim programs that are able to get children safe in water quickly. I believe in getting children safe first. Then they can go on to revel in their success and enjoy a lifetime of loving the water. My child was in traditional Austswim accredited lessons from 6 months and at 3.5years she fell off the step in a lessons whilst the instructor was taking the 3rd child out for their turn. She was vertical and trying to tread water but sinking. I had my 1year old in my arms and thankfully the instructor swept her up and she was back on the step. I enrolled my daughter and my son in kids aquatic survival a school the next week and within 2 weeks my 3.5 year old daughter was independently floating, swimming across two lanes and LOVED the lessons. She finished the program in 4 weeks. My nearly 2 year old son took 8 weeks and they both progressed onto transitional lessons with KASS. Nearly one year later we were in Fiji and both kids were in "supervised" Kids club and my son fell into the pool fully clothed at night. I didn't see or hear him fall in. I saw a commotion ran over and he was floating calmly on his back. The program taught him Life Saving skills which I have seen the benefit of. Can't recommend Kids Aquatic Survival school enough. As a swim school owner and teacher for 37 years with the motto of "teaching from the heart", I have observed this method knowing that there is a better non traumatic way! There is no place FOR ANY REASON to employ a method that causes so much trauma for a child. It appears to me that parents who choose to go down this path (due to their fear of drowning) believe that "the other way" only teaches water confidence. This is not true!! I can tell you that if you attended classes that DO NOT employ these forced methods every day you would see a tremendously happy thriving child who CAN SWIM! What we have known in our hearts and guts about the trauma these children are experiencing is now being proven by those that study the development of the brain. Their is no place for force in the teaching of swimming and water safety skills. The Australian Swim Schools Association does not endorse practices that can traumatise a child. Water safety skills can be learnt in caring, developmentally appropriate ways. Parent and child classes can be way more than just 'water confidence' - with that being a vital start. Importantly, now matter how well a child can swim, there is no substitute for constant, adult supervision and the provision of proper barriers. In order to present a balanced and factual article on this topic, it is important to advise readers that the methods used in survival back float programs such as the one referred to above, fall outside industry guidelines and as such are not endorsed by any of Australia's or indeed the world's learn-to-swim peak bodies, swim school registration or swim instructor registration organisations. In Australia these organizations include Australian Swim Schools Association, Swim Australia, Austswim, Australian Swim Teachers &amp; Coaches Association, &amp; Royal Lifesaving Association. The methods also contravene the UN Convention on the Rights of a Child in Early Learning Environments, Article 12 and contravene best practice in terms of promoting secure attachment and healthy brain development (refer to Position Statements on Australian Association for Infant Mental Health Inc). There is no substitution for adult supervision. A child can never be made "Watersafe". The methods used in survival programs are abusive and would, if used on an adult, result in assault charges being laid.